We want you to make the next Hackaday live event great. This is an Unconference in San Francisco on Saturday, March 18th and it depends completely on you. Get signed up now! An unconference is a live event where you decide the topic, guide the discussion, and generally make it an epic Saturday. We have a handful of speakers lined up to help get things started. But we also want you to be ready to give a talk. Everyone that shows up should be prepared to stand up and deliver eight minutes on something they find exciting right now. Kicking off the night we’ll ask each person to tell us the title or topic of their talk and approximate length of the presentation. Once all the titles are written down we’ll hammer out the schedule right then and there. If you haven’t been to an unconference this is the time to sign up, collect your thoughts, and jump into an afternoon of extemporaneous idea-sharing. If you have been to an unconference we’re guessing you signed up as soon as you saw this announcement. You can talk about anything you want, but constraints help. The theme of this Unconference is Build Something that Matters, a mantra we take seriously around here. We’ve spent more than our fair share of time hacking and designing without any purpose other than a learning adventure. But sometimes you should direct those mad skills toward something that does some good. As you think of what you might discuss in your eight-minutes-of-glory ask yourself what things matter to you and how your builds could fit into it. We can’t wait to hear your answers to that question. These talks go by pretty quickly so plan any demos or slide decks accordingly, and practice with an actual clock at least once. We will have a projector and podium available. We’ll also make sure to have food and drink on hand and we have some hardware giveaways planned. This is shaping up to be just like every other Hackaday get together: packed with technically minded people who know what they’re doing and more than happy to share what they know. This is a great way to mingle with people in the field you’re interested in. Don’t miss this Unconference, you’ll be hard pressed to find another one like it. I wish you could hold it in neutral country, like Nevada. I wish that they could have given more of a heads up period instead of a few weeks. Others might be able to just travel to San Francisco. Unfortunately I can’t. That is where having more then just three weeks to schedule taking off from responsibilities would be helpful. 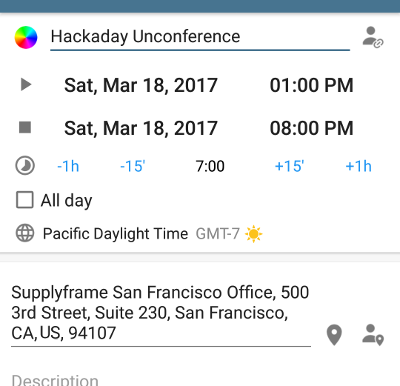 “The Hackaday Unconference is happening, and happening and happening. In LA, in San Francisco and Chicago.” This is the SF one, with Chicago going on sale this week, and the LA one is TBD at this point I guess. do a Boston one and I will happily run it and get sick engineers from my company to come and talk. I live for hackaday so hard ! Tell us, please, the REAL REASON you did this, Hackaday, given that–at the time you announced it–it was already too late to buy a 21-day, non-cancellable airline ticket to San Francisco. You really didn’t want anyone coming; right? Someone came up with an idea whereby we could have a party for our best friends on SupplyFrame’s dime, and make it look legit, right? You have to convince your bosses that you’re really doing something when you’re really not doing anything, right? You have a small gaggle of nerds down in Half Moon Bay you want to impress, right? 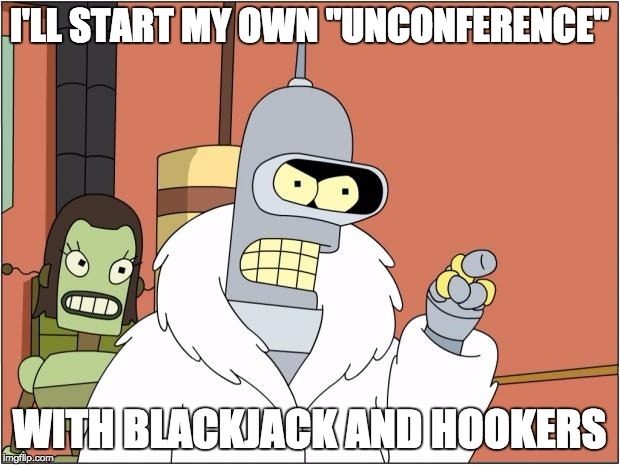 You did one thing correctly, you chose the most descriptive name: “UN-conference”. So…. San Francisco is not quite *walking distance* from Silicon Valley. And certainly nobody at *all* there would have any interest in such a thing. P’shaw. Hey guys. I don’t know if I’m going or not, but either way, I live in San Rafael and have a spare room. 3 available beds total. Stay for free for 1 or 2 nights, just don’t make a mess. Damn. Wasn’t fast enough. Added to the waitlist. All the cool people are on The Waiting List.